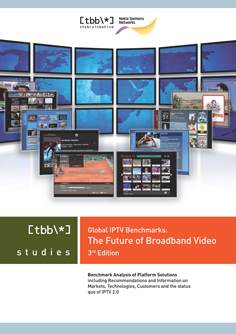 This years edition of IPTV Benchmark Study: The Future of Broadband Video is about to be published. Congrats to the colleagues of thebrainbehind. It’s an comprehensive update to IPTV Benchmark Study. This years edition was again published in cooperation with Nokia Siemens networks and is assesing relevant IPTV rollouts around the globe as well as a number of the most interesting video streaming websites. In both cases business models have been analysed in terms of product offer, ease of use and the range of content that is available as well as the usability of the services. It took no longer than a bat of an eyelid to change the arena of web entertainment forever. Yet, despite all large and small moves by industry majors, there is still a staggering amount of trial and error going on. But with content owners embracing the opportunities arising from a growing focus on relationship-driven business, a number of underlying strategic trends can be observed. Again, this year saw transactions from investors towards online video services and software companies of $461m in the pioneering market for the industry, the US (Dow Jones VentureSource). In web video, growth is expected to triple by 2011, as can be seen in the diagram below. Despite video ads being a relatively new form of advertising, they generated revenues of about $1bn last year in the US alone. It will increase to $2.9 billion by 2011 at an average annual growth rate of 48%, according to Strategy Analytics. As such it will be the growth factor No 1 for the segment. Worldwide and for all online video business models researcher InStat predicts a growth from $1.2 billion in 2007 to $4.5 billion in 2012 (CAGR at 39%). In the meantime social web, still a major factor for internet usage of geek dimensions (and WebTV’s structural complementor), will capture some $3.8billion until 2011 in advertising. The tremendous uptake of pull media is also shown in that more than a third of all US TV households are forecast to subscribe to or regularly use VoD on various platforms by 2011 (Informa), generating revenues of more than $11.4 billion. But besides all this progress being made on networked media, one should not forget that DVD usage is a well embedded habit. DVDs have been used by consumers for years. And to most the format is just perfect. This behaviour will only change gradually, usecase by usecase. Plus, despite the raw numbers of growth and usage, social networks are still trying to come up with successful ad models. It will certainly remain a key question in coming years how profits can be made from the massive amount of users’ time spent on MySpace, Facebook and Co.
As the following ranking of online properties in the US suggests, traditional media is still lagging behind the internet world’s incumbents. Another aspect, the widespread fear of converting analog dollars into digital pennies, has some considerable truth in it. As Will Richnond of the TDG Group stated recently as an example, NBC would earn a loss in value of up to 80% for one episode of ‘Heroes’ placed on hulu.com, instead of pouring it out via their network outlets. This might even be higher, if sales fail to harvest a double CPM for the piece. On the other hand such assumptions only become reality if conversion from push to pull media would evidently cause linear loss on traditional outlets. Except for younger audiences, which may never have been as connected as the old measurement model was suggesting, the decay remains yet hard to prove. And of course broadcasters here are great in proving the strength and vitality of connectedness with their audiences. Efforts to establish an integrated measurement system for the multi-screen landscape suggest that many players are hoping for more transparency on such questions soon. Summarising trends, it can be noted that an increasingly mature pull media is now a cornerstone in strategic decision-making. Video works as driving force behind the internet’s popularity and, accordingly, for advertising revenue growth and migration. This class still counts for the largest amount of content deployed throughout the web. It is these new platforms that are putting enormous disruptive pressure on traditional content owners. In an ongoing “tsunami of self expression” (New York Times), people are looking for ways to share their life and to draw attention to themselves. One of the most striking figures is without doubt the 10 hours of video being uploaded to Youtube every minute. 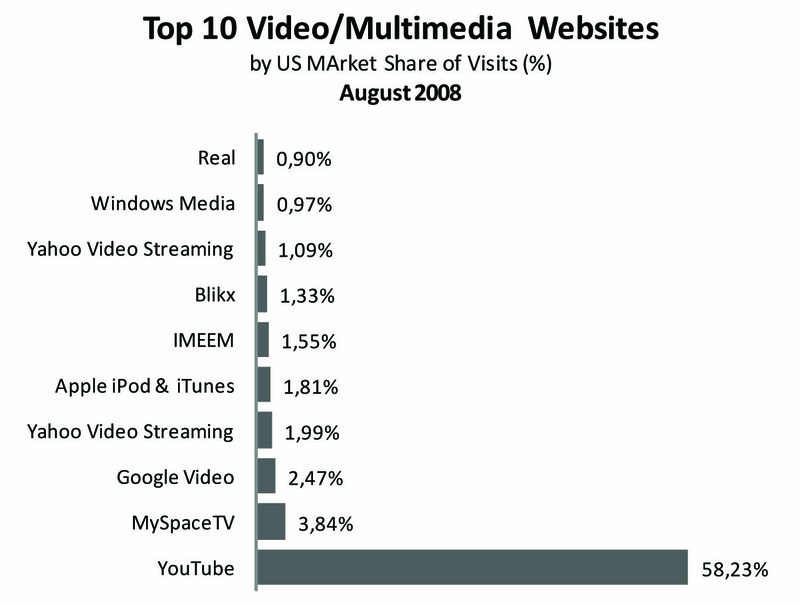 The following chart underlines the stellar advance of Youtube in this domain. Myspace is expected to generate $1bn this fiscal year (ending June 2009). WebTV platform provider Brightcove has closed deals with hundreds of independent content owners and is reaching out to attain a global presence with their increasingly mature SaaS services. Mainstream media’s alignment to aggregation platforms is of course a primary measure for meeting fragmentation tendencies. As content opportunities proliferate, capabilities in connecting audiences with highly relevant contents will become a source of growth, even if this leads users outside the former product’s boundaries. The task must be to absorb the consumer’s involvement and to create complementary assets around it. Mashups of user generated content are one way of achieving this. Hulu, for example, lets users compile their own rough edits of episodes of their favourite shows. In addition, Youtube has just recently launched an annotation tool where users can add notes and comments to videos. Not long ago, these features could only be found on specialised platforms features list – another indicator for the growing maturity of the segment. By introducing more and more of such features, prosumer communities and independent fan bases are changing not only entertainment from bottom-up, but brand communication as a whole. Whereas top-tier contents are attracting users in the first place and second-tier contents are setting the pace for community engagement, prosumer and other highly vertical platforms will continue to drive buzz and lead to a real pervasiveness of the magic of a video enhanced web 2.0. Web 2.0 Expo European Edition has just ended. See here for a stash of some interesting presentations. Some very interesting ones there, as insights to SaaS/cloud computing of salesforce.com. I wouldn’t had estimated that time for setting up a comparable webservice on SaaS has a factor of 40 between a promotion platform set up on .net. Another great piece of Alan Patrick is analyzing web economics and the limitations of ad-based business design. Marcel of netzwertig.com has a detailed discussion of the speech. Big shouts out to everyone!